Are you looking to build your first website, but you find the whole prospect daunting? If so, you're not alone. Designing your website and crafting its code can be disheartening, but luckily, there are plenty of tools out there to make this project as easy as possible. Since the mid-1990s, with the birth of Macromedia's Dreamweaver, there have been many website builders that can do most of the legwork required to get a website up on your behalf. Individuals and small businesses could now get online without needing help from an outside web designer and developer. While web designers and developers certainly have their place, the fees required to work with them could put them out of reach for many individuals and small businesses — hence the popularity of website builders. We don't pretend that website builders are a one-for-one replacement for web designers and developers, but we do think they're a great option for someone who needs a good-looking website. 3 How Do You Choose a Website Builder? 3.2 What Is Necessary For Every Website? 4 What Tools Do You Rely On? What Tools Can You Do Without? 4.1 Would a Drag-and-Drop Interface or Design Suite Help? 5.3 What Are Self-Help Resources? 8 Looking For Web Hosting Instead? Our team tested seven multi-purpose website builders available on the market today, allowing us to take a closer look at each of the options. 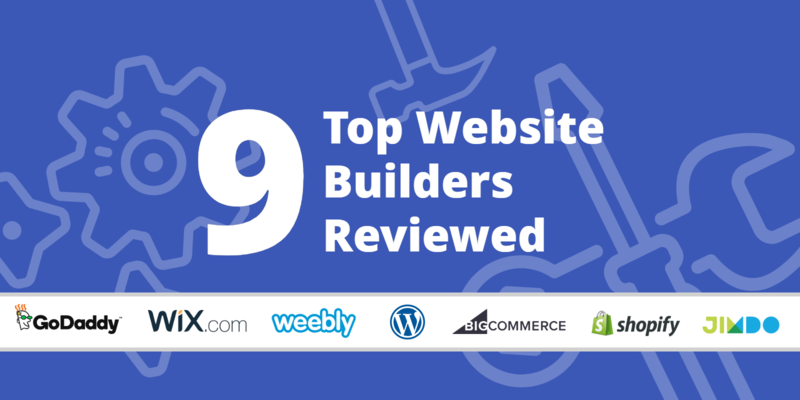 Not only will this serve as an informative look at the products themselves, but it will also provide you with an idea of what to look for when choosing a website builder and how you might evaluate the features available. Here are the seven tools we tested in detail. Yes, there are many other features to consider, but the above is a well-rounded comparison as to what you get for your buck. We will cover each website builder's strengths and weaknesses further down this page. How Do You Choose a Website Builder? In short, a website builder is an app that will allow you to build a website without requiring you to write 100% of the code by hand. However, as you can image, not all options are created equal. You can easily browse to the website builders' homepages and read through the feature lists, but in the end, we don't think that's the best way of determining the option that is best for you. One of the most important things to know early on is the kind of website you want to build. In some instances, identifying the kind of website you want is simple, but in other instances, you may have to do some self-reflection before proceeding. The simplest type of website available is a static website. These provide your readers with the most basic of information. Perhaps you are a small business, and you just want to provide your customers with your business' name, physical address, and contact information. Perhaps you are a niche photographer who wants to display some of your all-time best work. Regardless of who you are, static sites are best for those who don't plan on changing their content very often. At the other end of the website spectrum from static websites are blogs, which are updated very frequently. Typically, you will see content displayed in reverse chronological order. To help users find older content, the website will have things like search bars, tag clouds that allow you to pull up all posts based on the content covered, publishing calendars, and so on. If you are an artist, musician, photographer, movie maker, or the like, you might be interested in a portfolio website where written content takes a backseat to visual (or auditory) displays of your craft. There are a lot of ways you can design such a site — for example, there are many website builders offering templates that layout an abundance of high-resolution images for the aspiring photographer. If you are looking to conduct business online, an e-commerce site or online store is for you. Regardless of whether you are interested in selling physical goods or downloadable files, there is likely to be a template that makes it easy for you to display your products. Then, by integrating with the appropriate tools, you can accept payments, arrange shipping of purchased products, and/or provide secure download links to your customers. Forums, communities, and message boards are great options for websites that are frequently updated by multiple people. These options are similar to blogs, but rather than having your website be locked down and changeable by only a few people, such websites offer (limited) access to a large group of people. Each individual can then contribute and interact with others involved with the website. In the sections above, we have made some clear distinctions between the website types mentioned. However, keep in mind that you can certainly create a multi-type website. For example, you might want an online store with a blog and a message board. If this is the case, the only thing to keep in mind is that you will need to evaluate website builders to make sure that you will have all of the features you need to build such a website, not just the features you need for one or two types. What Is Necessary For Every Website? The specific implementation details for your website will vary based on what your goals are, but there are some things that every website needs. Responsive designs are those that change based on the user's screen size. This ensures that your website is attractive and legible to visitors regardless of whether they're using a desktop or smartphone (but to be quite frank, most users are on mobile devices). Internet users tend to be impatient, so you will want to make sure your website loads as quickly as possible. Depending on how the website builder generates the pages you design, you might find that your website has been created with code that runs at the speed of light. However, there are some products that are less optimal, creating pages with bloat that slow down your page load times. Having your website be “findable” is important. There are certain things that make your website easier for search engines to crawl and index. Moreover, you want your website to appear in search engines whenever someone searches for related keywords. A great website builder will take care of SEO-friendly sitemaps, metadata tags, and so on. You'll want something that offers you these features. Websites are important, but they are not the only way users interact with you. Social media platforms, especially the major ones like Facebook, Twitter, Instagram, and LinkedIn, are crucial for reaching your audience, and you'll want to be able to integrate your website with these platforms with ease. Big data is hot, and even if you aren't running the biggest website around, gathering the appropriate statistics can help you expand your reach. You'll know where your visitors are coming from, what they are looking for, what they like, and what they don't like. Some website builders can integrate with Google Analytics. What Tools Do You Rely On? What Tools Can You Do Without? Just because you need to implement a specific feature on your website doesn't mean that you have to have a website builder that enables said feature. Will I rely on a drag-and-drop editor or am I more comfortable using raw code? Can I take care of search engine optimization (SEO) or will I need tools to ease the pain? Am I able to design my site without support or will I rely on tools? How relevant are user analytics at the stage I'm currently at? Am I able to manage my content well or will I rely on a top-end built-in content management system (CMS)? For example, let's say that you are a photographer. Yes, you will want to display only photos that you have edited to perfection, but do you really need a website builder that offers robust image editing features? Probably not, because you already have stand-alone tools that you use that are much more powerful than anything a website builder could offer. Would a Drag-and-Drop Interface or Design Suite Help? Perhaps you are a designer — in this case, it makes sense to use your own design and let the website builder handle the behind-the-scenes wiring, so to speak. You might even eschew the provided media galleries and create your own interesting and unique media galleries. In short, think about what you do well — you probably have powerful tools to help with these tasks already so that you won't need the alternatives offered by the website builder. On the other hand, think about what aren't your strong points. Not a coder? We'd strongly recommend looking for a product a drag-and-drop editor. Is design, not your strong point? Take a careful look at the starting templates available to you. Lacking in visual aids? Look for a company that bundles access to a robust stock image library with its product. No matter how technically proficient you are, you will want to make sure that the technical support team backing your website builder is solid. If you are a beginner, your reasons to yearn for good support is obvious — the team can walk you through the product's features, help you get started building your site, and answer your questions when it comes time to go live. However, even if you are an advanced user who can handle the majority of arising problems, would you want to? You certainly could opt to tackle any issues that come up, but having a good support team backing you up means you have back up if you are too busy to troubleshoot yourself. Furthermore, not everything can be resolved by you — if you need to get in touch with the company about downtime, you will appreciate a team that is highly responsive. There are many ways to get in touch with a company's support team: telephone, live chat, support tickets, email, and so on. Wix has an impressive knowledge base. Not all companies offer all options, so if you have a strong preference for a given communication method, you might want to see if the company behind your website builder-to-be offers it for support. The knowledge base is a compendium of information related to the product at hand. Usually, knowledge bases are organized by topic and feature a question-and-answer format (though this is not always the case). Knowledgebase articles are great for reading about specific topics. How-to guides and tutorials are generally more comprehensive that knowledgebase articles. For example, a knowledge base article might cover a specific feature, while a how-to guide or tutorial will cover the ways in which you might use the feature to implement the functionality. Video tutorials are useful for those who want step-by-step assistance but would prefer to not read through lengthy written articles. Community forums and message boards are great for getting in touch with others who use the website builder you've chosen. You can certainly ask technical support-related questions on the forums, but you can also crowdsource project ideas and the like. The following sections are quick introductions to some of the more popular website builders available. We'll provide a high-level overview, but be sure to read the in-depth review for any in which you're interested! The GoDaddy Website Builder (sometimes referred to as GoCentral) is an affordable (with promotions), simple, and easy-to-use option that will appeal especially to those who want a simpler, static website. This website builder offers an e-commerce upgrade, but integrating the online store with your website requires some work. There are blogging tools, but again, your blog remains somewhat separate from your website and isn't seamlessly integrated. GoCentral's ease of use comes with a small compromise – it isn't the most powerful or flexible website builder around. Having said that, it's a great option for smaller businesses to kickstart an online presence. If you want a product that is super easy for you, consider Wix. Its fully what-you-see-is-what-you-get (WYSIWYG) interface means that you'll find Wix's website builder accessible, even if you are completely new to the world of website building. If you decide to add more complex features to your site, you can still do that, however, since Wix offers e-commerce features and integrated blogging. Wix's ease-of-use means that advanced users who are looking for the ability to fine-tune and tweak their websites should look elsewhere. There is an element of customizability offered by Wix, but its product features are aimed at those who are less likely to be working with code. Weebly is very similar to Wix in that both companies strive to offer easy-to-use options capable of bringing to life complex, professional websites. With that said, where Weebly shines is its inclusion of advanced features supporting things like e-commerce, monetization, and blogging. The specific features you get depends on the package you choose, but prices for all are fairly reasonable as compared to similar companies. The biggest problem with Weebly is likely to be the limited amount of customization you can do with your site. If you're relying heavily on templates, this might not be an issue but do know that you won't have a free reign over how your final website will appear. Small changes are easy, but large ones will likely be difficult to implement. WordPress is one of the biggest content management systems around, and you can choose between a free, self-hosted version or a paid, fully-hosted version. Over time, the WordPress platform has grown, and with it, its complexity. We won't say that it is super difficult to use, but there is some bloat to wade through, especially if you want to keep things simple and manage just a blog (though you can do plenty with WordPress, its origins are in blogging). WordPress is widely used, and as such, there are numerous plugins and themes you can use to customize your website. Your project can be super simple or super complex — it is hard to say without knowing the specifics relevant to you, but what we can say is that there's very little you can't do with WordPress. If you are looking for something that caters more to those looking to sell online, consider BigCommerce. BigCommerce offers many features online merchants will find useful (e.g., order tracking, marketing) with an easy-to-use interface. BigCommerce offers a fair number of features typically found in website builders, such as free templates, WYSIWYG editors, and so on. However, the company's focus is definitely on commerce, so while these features are good, they are not best in the industry. Shopify is one of the most well-known online store builders around. However, Shopify can be quite pricey, so if e-commerce isn't one of your primary reasons for launching a website, you might want to look elsewhere (for example, there's no reason to choose Shopify if you're just launching a blog). Shopify claims that it can support businesses both small and large, and this appears to be the case given the features that ship with the product. However, this also means that Shopify can be daunting and difficult to use, especially for new users. This isn't an insurmountable problem, especially since Shopify's docs are decent, and with the sheer number of Shopify users around, you're likely to find (free) help online. Jimdo isn't as well known as some of the other options on this list, although if you are looking for something that offers features catering to both beginner or intermediate users at a reasonable price, Jimdo might be for you. The downsides, however, include a more limited selection of templates, a smaller list of features, and slower responses from the support team. However, “more limited” might not be a problem if everything you need is included, so do give Jimdo a look if your budget allows. Squarespace is undoubtedly one of the best website builders in terms of design and aesthetic appeal. With tons of templates and a functional drag-and-drop builder, aspiring website builders can be sure to experience an array of full-on features. Additionally, Squarespace is classed as a developer-friendly website builder with above average lenience for customization, though as a result, some beginners may struggle to get the hang of this tool as quickly as easier alternatives. Webydo is a niche website builder which primarily aims to please web designers who wish to build sites, alternatively, designers who wish to manage clients' sites. With design being the strong-point, Webydo users can be assured to have a slick, professional looking website at their disposal. Themes are available, though templates are limited – this is a customizable website builder aimed at savvier webmasters who are in for an adventure. Overall, Webydo offers some great features, including useful SEO tools to get visitors flowing when a website is launched. If you are interested in launching an e-commerce site, you can't go wrong with Shopify. While Shopify can get expensive, you are likely to find all of the features you could possibly need. If not, there is a robust Shopify community offering add-ons and the like so that you can build the fully custom store of your dreams. If you want to start a blog, WordPress is the option for you. While WordPress can be used for any type of site, its origins are in blogging, and this is still an area where it excels. If you want just a static website on the cheap, consider Wix and Weebly. Both options offer easy-to-use interfaces which means that you can get up and running (even without financial investment). However, if you need more, both companies offer paid options that get you a bit more resource-wise. From what we've seen, there are both personal and business-appropriate options with regards to themes. Once you have chosen the best website builder for your needs, it's time to purchase the best subscription for you (assuming you aren't starting with just the free option, if available). Most companies offer 3-4 subscription options, with the option of upgrading easily over time. When you're just getting started, the entry-level (or the option just above) would likely be where you would want to get started. These plans get you enough to get started, but you also aren't spending a fortune for something that might not work out well for you. With that said, pay careful attention to how prices are displayed. Generally, providers ask that you sign extended contracts, and in return, you'll get larger and larger discounts — in short, the longer your contract, the larger your discount will be. There are, however, vendors who ask for annual contracts yet do not offer any discount. The upside is that most website builders offer a 30-day money back guarantee so if you decide within that time period that its product isn't for you, you can receive a full refund of all monies paid. Looking For Web Hosting Instead? If, after reading our website builder guide, you've decided to stick with WordPress + web hosting instead, we can still help. Our sister site, WhoIsHostingThis, has published a step-by-step guide on choosing the best web hosting for your site. There is a lot to consider when choosing a website builder for your new website. However, each option has its strengths and weaknesses, so the best way to narrow the field and choose the option that is best for you is to begin by focusing on your needs. Rather than letting the vendors dictate to you what they think you need, your search will be driven by the needs of your website.